KUALA LUMPUR—Our Cebu Pacific flight 5J501 left for Manila at 9:10 p.m. last Sunday and landed at the KL Airport at 12:45 a.m. yesterday. The flight was, to borrow Thai Airways’ slogan, as smooth as silk. From Cebu, on board the plane were myself and my wife Jasmin, top ophthalmologist Dr. Ronnie Medalle and his wife Steph, and Mark Aseniero and his wife Ding. 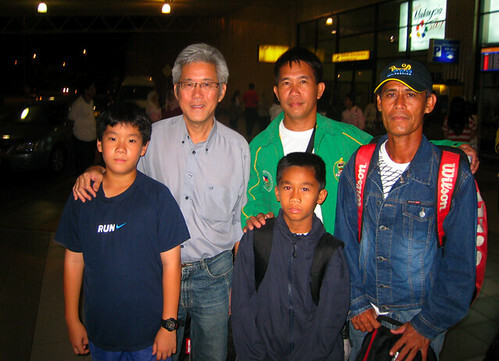 Plus, there was a surprise Cebuano we met at the NAIA departure area: Vince Marc “Mac-Mac” Tabotabo. All of 10 years old, you’ve read the “TABOTABO” name publicized in these sports pages many times. He’s RP’s no.1 tennis player in the 10 and under category. Accompanied by his dad Titus and coach Dodong Ruelan, Mac-Mac (together with Nino and Sally Mae Siso and Jacob Lagman) will join four tennis events here in Malaysia. At the KL airport, we posed for some photos before boarding the bus to drop us at Capitol Hotel, our sleeping quarters for the next five nights. How long from the airport to the Kuala Lumpur city proper? Eighty minutes! We got to the hotel at 3 a.m. Yep, an unholy hour but not to worry: the view from our room revealed two structures that touched the clouds: the Petronas Towers. We are here, of course, to watch two prime-time exhibition matches. Tonight at 8 p.m., we sit inside a 12,000-arena called the Malawati Stadium and watch the world’s no.2 and no.8 tennis players. Rafael Nadal, who’s won three French Open titles and has been Roger Federer’s bridesmaid for the past three years, plays Frenchman Richard Gasquet. The Federer-Sampras exhibition match in Kuala Lumpur is part of this country’s 50th year anniversary. And, it’s part of a three-match series between the two players. Tonight in Seoul, South Korea, they play their first exhibition. On Nov. 22 (Thursday), it’s here in KL; and on Saturday, it’s at the Venetian Resort in Macau. Can Pete Sampras, four years off retirement, hairline receding and 36 years of age, give a challenge to The Federer Express? What do I think the score will look like if these two give their very best? Federer, the gentleman that he is, will not embarrass Sampras. Because if Roger were to play his best—like he did last week when he won the Tennis Masters Cup by beating Andy Roddick, Nadal, and David Ferrer in three straight, perfect-tennis days—then Sampras will lose 6-1, 6-2. That’s right. It will be a no-contest. Federer is at his prime, standing at the summit of tennis’ Petronas Towers, while Sampras, well, has gone down to base camp after previously-conquering Mount Everest. Still, the excitement, I’m sure, of watching The Best Ever (that title still belongs to Sampras, who owns the record 14 major titles) relinquishing his throne to the soon Greatest Ever will be a sight to remember for life. Joining us on Thursday night are my brother Charlie and his wife Mitzi, Rene Ven Polinar, Jess and Jacob Lagman, and Sun.Star Cebu’s Chinggay Utzurrum and Michelle So, both of whom are self-confessed Federer fanatics. And to you all who can’t be with us here, I heard from Fabby Borromeo that all three Roger-Pete matches will be shown live on the Balls channel of Skycable. So don’t miss these schedules: tonight, Thursday and Saturday at 8 p.m.